Look at all this from just one harvest?! 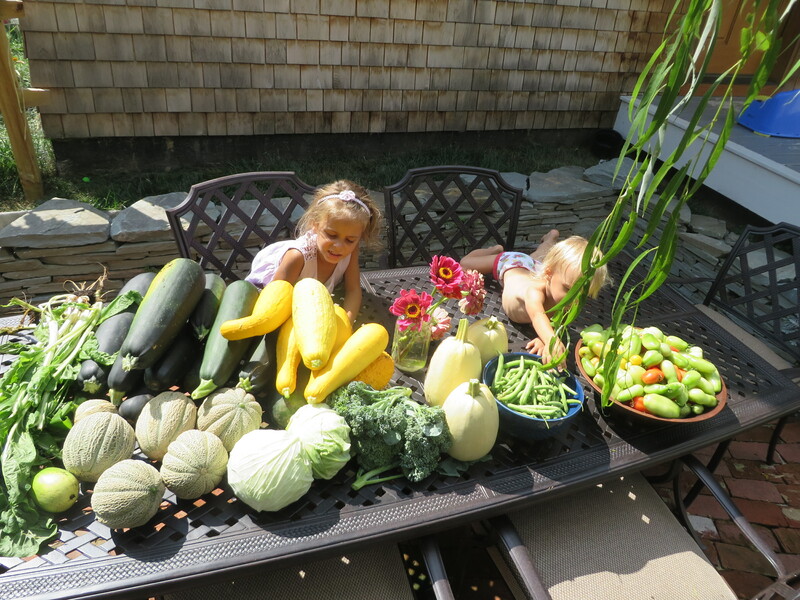 Yeah, next year we won’t plant so many squash/zucchini plants! I just can’t believe this was a few short months ago! 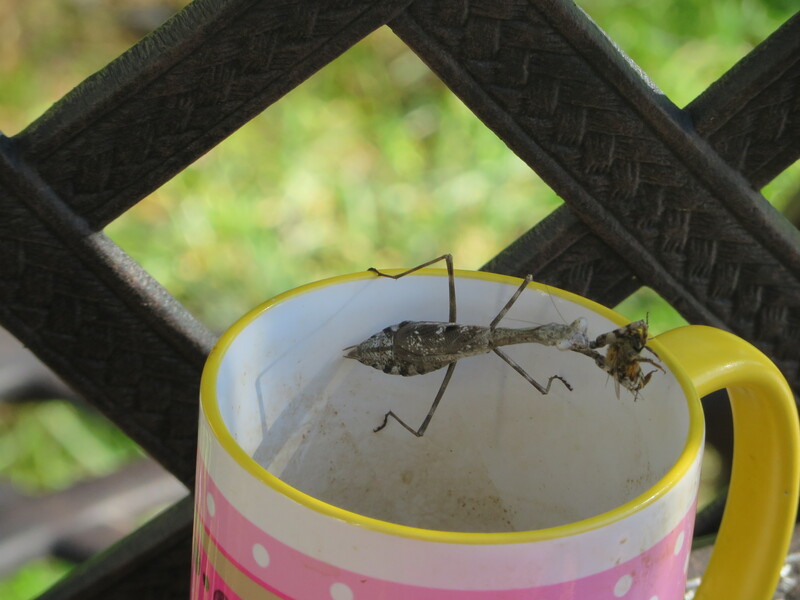 Well, this post isn’t just about saying goodbye to the growing season; it’s also about saying goodbye to our praying mantises (and since I’m a court reporter and a nerd, I looked this up, and this is the correct plural form of mantis!?) that we hatched from eggs this year! What a fun way to do some good for our garden and experience, sort of, having little insect pets. Praying mantises are beneficial insects that eat other, non-beneficial insects. They are great for your organic garden and can eliminate the need for poisonous junk being sprayed all over your edibles! Besides being great other-bug-eaters, these little guys are just really cute and fun to watch. After our mantis eggs hatched this summer, we scarcely saw any mantises around the garden and were worried they didn’t make it. Miraculously, months later, we have been seeing three-inch adults here and there around the yard! Our yard is just a half-acre, so being out there everyday, you get to know every tree, every place a worm could be hiding, etc. Sometimes you need to think outside the box to come up w/ your entertainment. Low and behold, the mantises reappeared right when we needed to spruce things up! I needed a way to attract them close enough so that we could watch them and interact. Then it came to me! We make kombucha, a sweet and sour fermented tea beverage, that bugs absolutely love! We also own a coffee mug. Those two things have proven golden in our quest to enjoy these last few days of fall. What great luck to have such charming lunch guests! Of course I wouldn’t end w/out a photo of Paul, or Duncan (I’m not that good, so I don’t know which is which!) chowing down on a bee that he caught in the kombucha mug. Look at this beautiful guy! If you are interested in getting praying mantis eggs to experience the hatching w/ your kids (or for yourself – I would seriously do this, even w/out kids! ), I got my praying mantis eggs here. We also did ladybugs, but I don’t see them anywhere and didn’t all summer. I would say that they are more instantaneous fun for the kids as they come live. Just like the mantises, they are beneficial organic gardening pets/tools. They dine on aphids that dine on your plants! You can get the ladybugs here . I’m sure, at least here in the Northeast, you won’t be able to get these this time of year. But this could be something fun to keep in mind for spring! Would love to know if you get them how they do. We will be doing both again next year! Wishing you a fantabulous fall day today!